eople in the business of art approach their world in different ways. Not everyone is concerned with fostering an aesthetic. It's strictly business for some, and they may as well be selling used cars. And as conceptual art has become more and more important, aesthetics have not always been on the front burner. In times like these, times of fear and stress and high anxiety, people question how art can even matter at all. We saw those kinds of articles in the paper, right after the attacks. Elizabeth Murray told The New York Times she felt powerless and uncertain, that maybe her art was useless. In fact, right after the attacks, a critic wrote that Dave Hickey's idea of "Beau Monde" may be of no importance, something to now be disregarded. But I don't agree and I'm not alone. Hickey never claimed that we should disappear into beauty, or that it should lull us to sleep. He merely pointed to where great art comes from  the need to communicate in a meaningful way. And the way to get a message across most effectively has always been great design and beauty. If you were to ask Hickey or Milton Glaser what they thought, they'd likely say that to make art right now is one of the most important things one can do. On the day of the attacks, I had to lift myself away from that TV. I had to walk and walk and eventually went to my studio. Some people may say that to make art in such grief is selfish, but I think they are not completely correct. Look at the cave drawings. They are not merely concepts or ideas. Centuries later, they are still "beautiful." 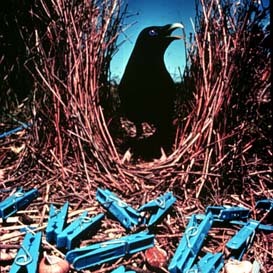 In Glaser's new book, Art is Work, he speaks of the bowerbird. The male creates a bower to entice the female. If the female so much as enters this bower, she is his and they mate. But only if she likes the bower. So the male spends a lot of time on this structure, gathering all kinds of things, combining stones and colors to make the bower beautiful. If his art is beautiful, he can be assured of passing on his genes. It's an example of how aesthetics are a part of our survival, of evolution  and more important than ever given credit for. Design is important to everyday life, even to the birds. The female seems to want her children to have the right sensibility of beauty. Art and beauty are somehow linked to our survival and not just in a cultural sense. Art can be a survival mechanism. I, too, have a need to foster aesthetics. And to make images which please me is not the only aspect. Some artists are basically concerned with their own trip and the trip of contemporary art  what their neighbors do. But I've always been interested in art history; what defined beauty in the past, what constitutes universal good design. Kandinsky said that great art must have two things: to be a child of its time, but to also have a timeless, universal appeal. I think you are missing out if you concentrate too much on the first  but if you think of it at all, it's a good thing. To be at all selective implies health on a very basic level. See more from Eva in our archives.